Bollywood celebs have always been known for the luxurious and sometimes insane pampering they give to their kids. So, when it comes to the cutest B-town child, Taimur Ali Khan, how could parents Kareena Kapoor and Saif Ali Khan take a step back. Bollywood celebs have always been known for the luxurious and sometimes insane pampering they give to their kids. So, when it comes to the cutest child in B-town, Taimur Ali Khan, how could parents Kareena Kapoor and Saif Ali Khan take a step back. Everything around Taimur, since the day of his birth, has been special. So it didn't come as a surprise when his coolest parents decided to throw him a grand pre-birthday bash on his second birthday. As Taimur would turn 2 on December 20 this year, let's take a look at all the insanely crazy and adorable things he has received as gifts in the last two years. A forest: Some get cakes on their birthdays, some get expensive gifts, some get dresses, some get a small vacation; but since it was Taimur's first birthday so the gift had to be something special. Celebrity nutritionist, Rujuta Diwekar, gifted a 1000 sq-ft forest to baby Taimur when he turned one. Yes, you read it right! Take a look at the forest below. 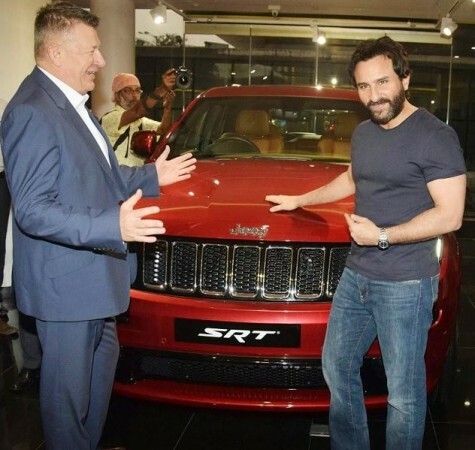 Swanky Jeep: Since it was his first birthday, daddy Saif Ali Khan also decided to splurge a bit and bought a swanky new Jeep for the chhote Nawaab. Talking about the Jeep, Saif had said, "There is a baby-seat in the back of the car, so I think I will take Taimur out for a ride in it. He will get the first ride for sure. I think I'll give him this car. Security is also very important and this car has a lovely baby-seat in the back and I am very excited, I think Taimur will love the colour, nice cherry red jeep. So, I have thought that I will keep this car for him." McLaren: Even though there is still some time for his second birthday, Bebo and Saif have already started pampering and presenting the little one with adorable gifts. For his second birthday, Taimur received a brand new Mercedes Mc Laren as a gift. Hold on! Hold on! Before you fall off your chair, let us tell you that it was actually a remote-controlled toy car McLaren. 800 crore palace: It is no secret that the trio Sara, Ibrahim and Taimur would inherit the 800 crore Pataudi palace. Taimur had celebrated his first birthday at the palace with parents and relatives with huge aplomb. World tour: From staying at a royal palace in Gstaad, Switzerland to enjoying a lavish holiday in London; Taimur is probably having the best time of his life, already. This year, the trio had taken a long and relaxed holiday at the Maldives amid some breath-taking views.